With a speed of up to 27 straps every minute, this automatic strapping machine offers a fast, accurate and consistently reliable solution. Ideal for high volume industrial environments where speed is of the essence. This handy machine really couldn’t be easier to operate – simply place your carton under the arch, and at the press of a button or pedal it will be automatically and securely strapped. Three modes of activation are available: foot pedal, console button or ball switch. You can adjust the tension of the strap by means of a simple dial easily accessible on the outside of the machine. 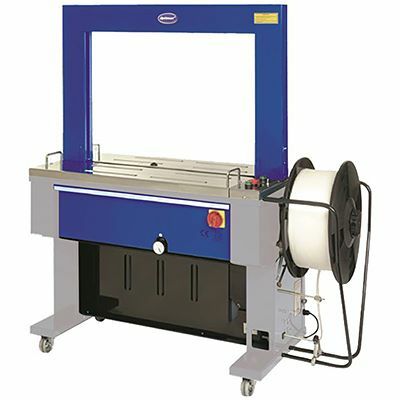 There are four options available for this automatic strapping machine – choose one of three strap widths (9mm, 12mm or 15.5mm) together with either an 850 x 600mm or 1050 x 800mm arch to suit your application.